Note: This story was originally published Nov. 27, 2007. – Ed. HUMBOLDT – A county with a strong alternative culture populated liberally with persons of distinction, Humboldt gives refuge to eccentrics, exceptions to the rule and expatriates from Mainstream America of all strains and stripes. One can scarcely cross the street without tripping over some uncanny oddball or undiscovered genius. And then there was Sasikala Devi. Known to friends as Sashi, her small, stolid figure was often seen hitchhiking in trademark plaid flannel jacket and red bandana, thumbing her way to some industrial ghetto with a hunk of maritime hardware of questionable origins in her capacious canvas bag. Just another nose-ringed, Hindu-named, Celtic-tinged, far right-wing, animal loving, literature-immersed, possibly transgendered nautical salvage groupie? Yes, but there was more to Sasikala Devi. She charted her own course – always navigating her way against the grain, wherever she was. It may have made perfect sense to her, but Sashi’s contrarian ways left friends and family scratching their heads at the life complications and outright pain she almost intentionally caused herself. Unlike some rebels, Devi didn’t sign on to one of today’s accepted categories of alternative lifestyle. She wanted nothing to do with environmentalism, cannabis culture, leftist politics or hipsterism of any sort. Trends were anathema, and whatever prevailing milieu she found herself in, she fought it with the same tenacity she battled the various afflictions that eventually consumed her over the years. The ruggedest of individualists, Sasikala Devi went about life her own, often lonely way until her final moments in the material world, which came Sept. 12, 2007. Born in Brooklyn, New York, Devi’s family moved to Whitefish Bay, Wisconsin, near Milwaukee, when she was a baby. There, and in other places later in life, she never fit in, nor tried to. Rather than form friendships, Devi enjoyed spending time with hardware, frequently playing with fire. By age 10, she’d burned down a small shed, and in her teen years, she graduated to systematic materials experimentation in the family basement. There, she’d fabricate molds, melt Coke bottles and other items, more than once triggering an explosion. “She was always heating things up, blowing things up,” her brother ruefully recalls. “There were lots of dramas.” Shards of blast debris are still embedded in the basement walls at the family home. A delinquent with socialization problems, at 14 Devi was sent away to a boarding school for a couple of years in hopes that the structure and discipline would bring her into line. It didn’t take. On returning to Wisconsin, the teenaged Devi wore paisley pants and smoked a Sherlock Holmes-ish calabash pipe. Angling for a career as a merchant seaman, she acquired a mariner’s permit. The flouting of convention attracted all the negative attention a flamboyant midwestern iconoclast might expect. “She’d get bothered because she didn’t want to blend in,” Forrest says. A family trip to San Francisco at the height of the Flower Power era proved fateful. The siblings visited the fabled Fillmore West and Haight-Ashbury hippie meccas, at some point scoring some marijuana. On returning to Wisconsin, word got around that Devi had actual pot, and a close friend badgered her for a sample. Finally, she gave in and gave the friend a joint. He immediately turned the marijuana cigarette in to police, and Devi was arrested. “They took her out of high school in handcuffs,” Forrest says. A felony drug conviction followed, and worst of all, her mariner’s permit was revoked, ending her dream of a career as a merchant seaman. The friend’s betrayal affected Devi on some fundamental level, her brother recalls. “The worst part was that it took away her dreams,” he says. Devi next took off on the most unlikely tangent imaginable, moving to Canada, joining the Hare Krishna movement and changing her name. “She was deeply involved in that sect for years,” Forrest says. The shipyards of Benicia beckoned from across the bay, and there, the post-Krishna Devi was able to immerse herself in her first love – the one that had never betrayed her – things nautical. 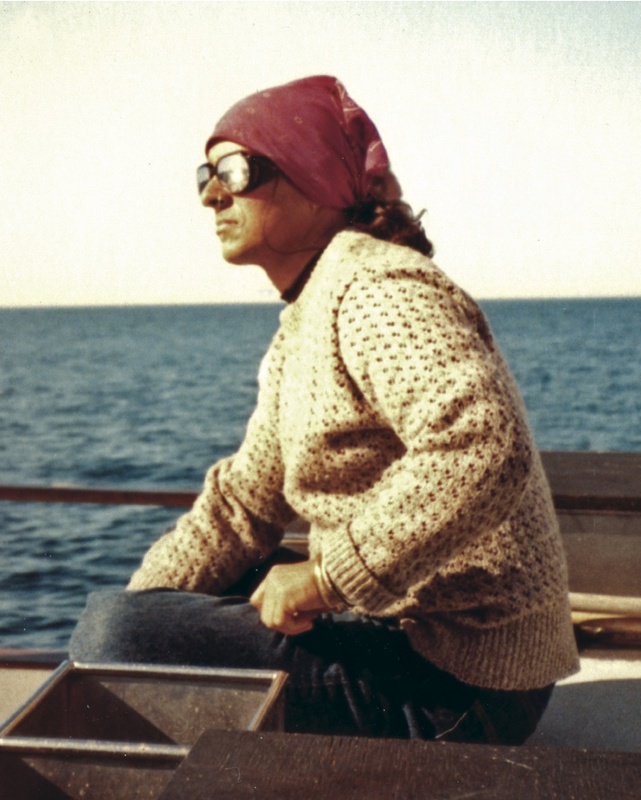 The harsh environment was paradise for the nose-ringed woman with the Hindu moniker, who created a niche – and a name – for herself by working the docks, serving as a deckhand on tugboats and immersing herself in the seaport’s industrial underbelly, laboring alongside its roughneck laborers. “She was kinda famous around here,” says Benicia welder Mark Lacey. Devi lived amid the “funky old buildings,” doing salvage work and pushing around a massive, 400-pound railroad luggage cart laden with scrap. “Why do you push that damn cart around?” Lacey asked her one time. “It pleases me,” she replied. The hard life appealed to her in every way. “She’d get a place down there where you weren’t supposed to live and camp out with her kerosene stove,” Lacey recalls. For sustenance, she’d roast lamb or mutton on it – a far cry from her vegetarian Hare Krishna years. Still, in a tradition that she maintained through her later life, she’d bake savory shortbreads for her friends, giving them away for Christmas. Along with scrap and salvage, she dabbled in sandblasting, built stoves and hung out with the “crusty old shits that run the yards,” according to Lacey. “They loved her,” he says. Not everyone did. The oddball Devi was beaten up and robbed by thugs and harassed by police. Even friends ran afoul of her standards, and were written off for periods of time. “She didn’t talk to me for a year a few times,” Lacey chuckles. One incident is typical of the relationships Devi fostered with journalists wherever she lived. Columnist Herb Caen included an item about her in after she was arrested for chasing off a panhandler with an axe at a bus stop. Always a stickler for precision, she wrote the columnist a lambasting letter, pointing out an error about the axe. “It was a custom-made tomahawk, you moron!” she told Caen. The hostility was all intellectual, Forrest assures. “She had no intent of hurting anyone,” he says. On finding a new piece of hardware, Devi would learn everything she could about it. “She’d research something until people didn’t even want to pick up the phone any more,” Lacey laughs. “The only vehicle she ever bought that had a motor in it was a forklift,” Lacey says. 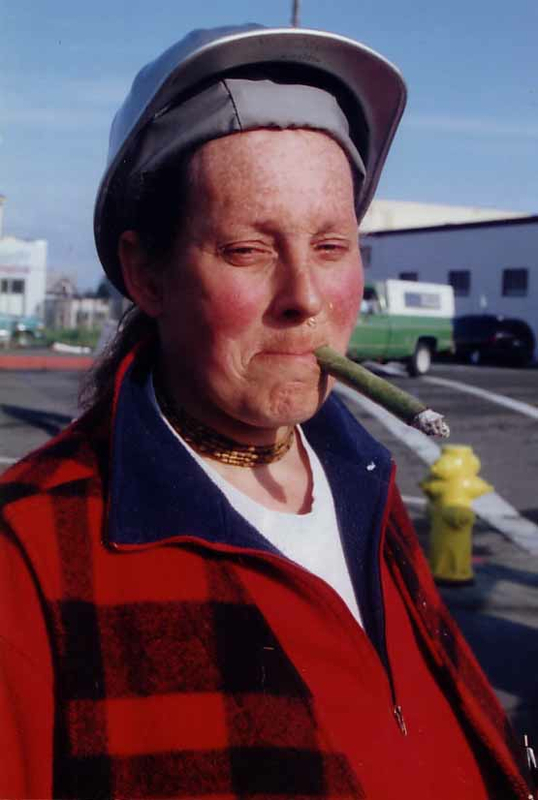 In Benicia, as later in Humboldt, there were rumors that Devi had changed her gender. And there, as here, she denied it. “Not that I know of,” was her reply when directly asked one time. Lacey also asked, and got a negative response. Out of respect for her wishes, her brother declines comment on the matter, which includes not disclosing her pre-Krishna childhood name. 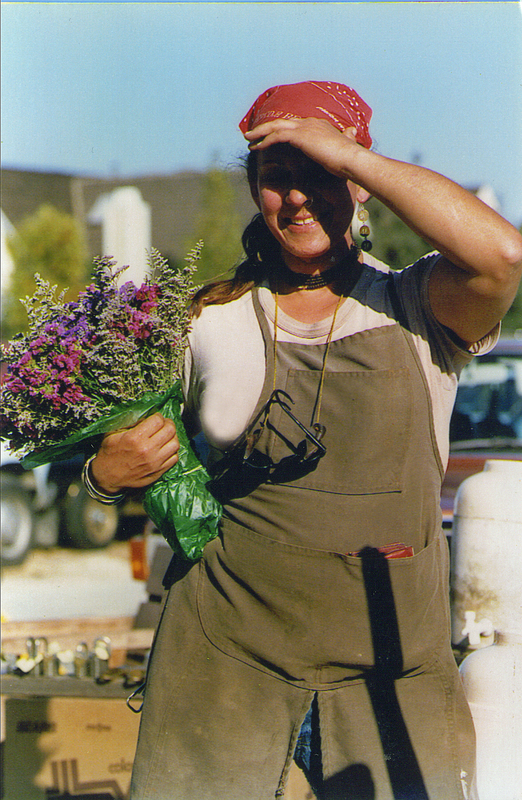 Somehow, about 20 years ago – no one is sure why – Devi gravitated to Humboldt County, taking up residence on Baird Road in McKinleyville. 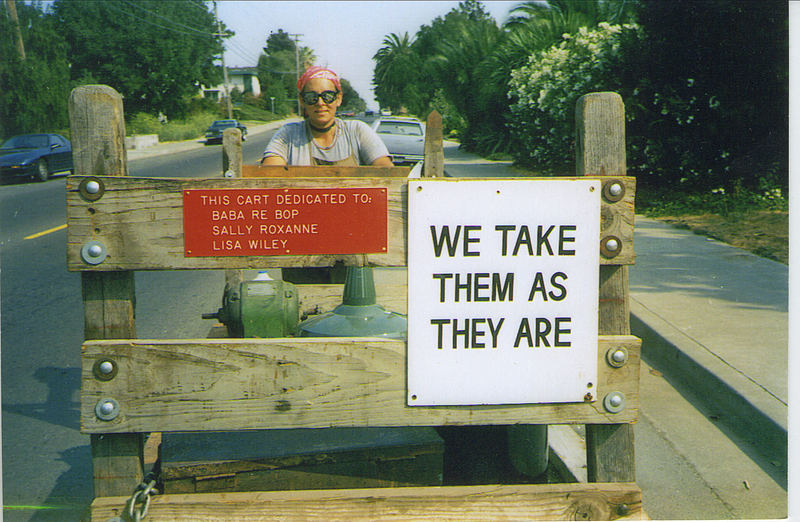 There, settled in her ways, she built a life around familiar elements – trading in scrap and salvage pushed about on a giant cart. She also found love – with three canine companions. “She loved her dogs,” Forrest says. Devi was known to shelter and feed strays and other animals she encountered in her travels. Woebetide the editor who mis-described a piece of hardware – mistaking a blowtorch for an acetylene torch, for example – or who made a play on words that violated her peculiar sense of language. The letters would come in bearing a return address topped with “Tugboat Annie,” or “Enola Gay.” Some didn’t include a letter, just a clipped picture of a mushroom cloud with “Arcata” written over it, or the “Dear Officer Krupke” section of West Side Story, with caustic annotations added. No small wonder, then, that even as she antagonized editors, Devi befriended bookstore workers and academics. Jere Bob Bowden, manager of Eureka Books, recalls his first encounter with Devi. “The door opened on a winter’s day and I heard this clanking sound,” he recalls. Down the aisle came Devi, her tool belt festooned with keys and metallic appurtenances and what looked like an anchor chain around her neck. “The links were as big as my wrist,” Bowden says. There and at other bookstores, Devi would order books on heavy equipment, tugboat boilers, ship engines, antique foundry systems, plus more intellectual tomes by conservative writers like Dinesh D’Sousa and Judge Learned Hand. And she still read her Vedic scriptures by A.C. Bhaktivedanta Swami Prabhupada. “We would have intellectual conversations that bespoke a broader education,” Bowden says. Sashi the beauty queen. Photo courtesy Richard Forrest. Another literary friend was Anne Marie Dannenberg, a Women’s Studies lecturer at Humboldt State University. The two would get together for dinner and conversation. “She had challenges, but underneath the bluster was a very kind person.” That didn’t mean Devi was soft on liberalism. “I couldn’t stand her politics,” Dannenberg says. “She would try to sell me on Phyllis Schlafly.” Devi’s other conservative heroes included Archie Bunker and Rush Limbaugh, who provided grist for her frequent blasts at “vagrants” and “feminazis.” A frequent target was Arcata’s “hippies,” whom she decried for their “dog turd” dreadlocks. Interestingly, she never used the Internet, nor owned a television. That may be why she amassed such a large archive of her writings and researches, all laminated and meticulously filed. Devi’s own life ended in considerable pain. She’d beaten back cancer 10 or so years ago, but according to Forrest, her liver finally failed after three decades of managing hepatitis C. She’d also had foot problems which had required surgery, and not driving hadn’t helped. She’d come down with pneumonia in April, and on top of that, a throat problem which gave her her trademark hoarse voice had worsened, preventing her from eating, which led to malnutrition, drastic weight loss and wasting. Dismantling Devi’s worldly possessions is physically as well as emotionally demanding for Forrest, as her home is packed with industrial equipment such as compressors and the ever-present railroad cart in the living room. Sasikala Devi. Age 58, Merchant Mariner, Artist, Social Commentator, Contrarian Extraordinaire and Gentle Spirit, entered karmic life a Vaishnavite (Hindu) on September 12, 2007, in Eureka. Sasikala is survived by loving parents, Norma C. Turnbull of Cincinnati, Ohio, and Robert Forrest of Palm Beach, Fla.; and devoted brother, Richard K. (Skip) Forrest of Fox Point, Wisc. ; along with many aunts, uncles and cousins who loved her. This entry was posted on Sunday, June 26th, 2011 at 6:19 pm	and is filed under Community, Obituary. You can follow any responses to this entry through the RSS 2.0 feed.